AARCO Display Products began in 1962 as the Alginon A. Roberts Company in Los Angeles, CA. In the early 1970's Under the ownership of Ron Rickleffs the company name was changed to AARCO display/design and became a full service store fixturing company. The Company's assets were purchased in 1994 by Estairr Display, renamed AARCO Display Products and moved to Fullerton, CA. 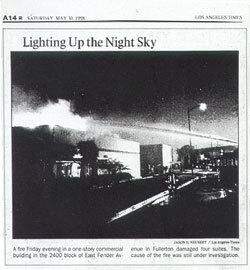 May 29th 1998 AARCO Display was struck by a devastating fire that destroyed it's building, all stock and equipment. Within a month we were back in business shipping orders. After a year of hard work we were back in our same building again. Today AARCO Display Products has become a leading manufacturer of Acrylic Products.